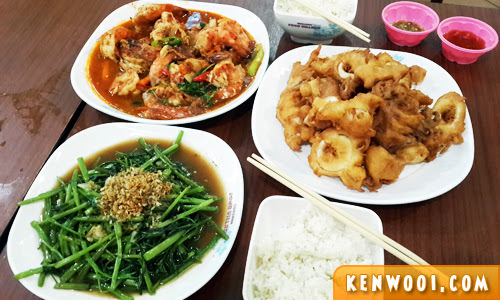 Generally, Thai food is known for its aromatic essence focusing on fundamental taste senses – sweet, sour, salty, bitter and spicy. As complex and scrumptious as it may sound, there weren’t much local Thai food that fits that description during our Phuket-Krabi trip. Admittedly, there wasn’t much effort put into looking for exotic Thai food. FYI, we are more of scenic travelers. 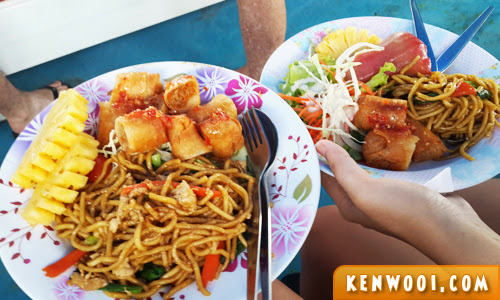 At both Phuket and Krabi, majority of our meals were either unplanned or was part of the lunch provided by island-hopping tours. The meals we got were as simple and affordable as it could get. 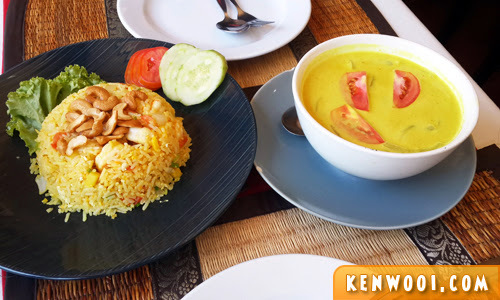 On our first day at Krabi, we checked into Aonang Cliff Beach Resort and headed to the main street to have lunch. Most of the eateries there serve not only Thai food, but also Indian, Pakistani, and Italian food. Perhaps this variety is meant to cater for tourists with different taste-buds. You can hardly find a place that serves only Thai food. We ended up at a Thai-Indian eatery, and ordered a plate of pineapple rice with cashew nuts and a bowl of beef curry. The meal cost THB368 (RM37.83) inclusive of tax. 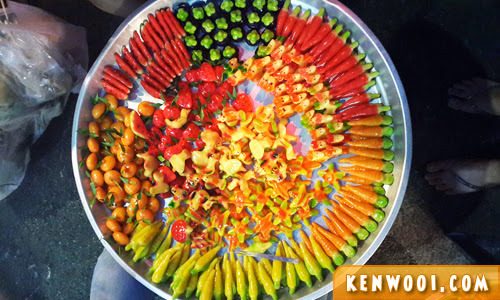 During the first night at Ao Nang, we visited the Krabi Night Market to indulge in the local street delicacies. The prices can be as low as THB40 (RM4.11) depending on the food we purchased. 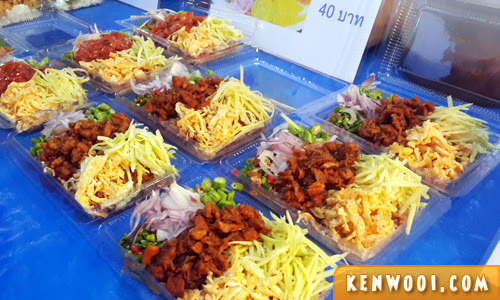 With about 30 food stalls, visitors are spoilt for dinner choices -from snacks to light bites, and from packed food to desserts. It was an opportunity for us to try as many local delicacies as we can. To begin with, I’m not familiar with all of the Thai food. So, there were interesting food discoveries (at least for me). 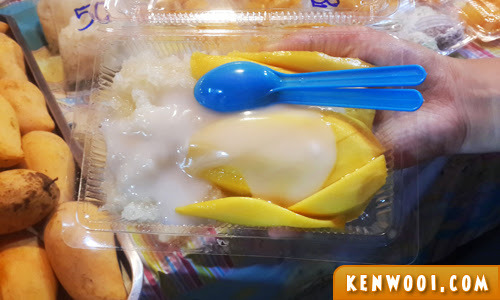 For example, this Mango Sticky Rice (or commonly known as pulut for Malaysians) topped with condensed milk is simply delicious. It costs THB50 (RM5.14). We tried about 8 different types of food at the market, and boy.. it was fun. The experience was way better than sitting at a physical restaurant. I have a love-hate relationship with this Egg Fried Squid. 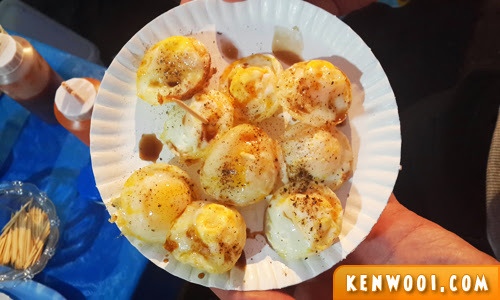 I love eggs, and I love squid – but it was SO spicy that my whole mouth was breathing ‘fire’ for a while. Damn… but it was worth it! 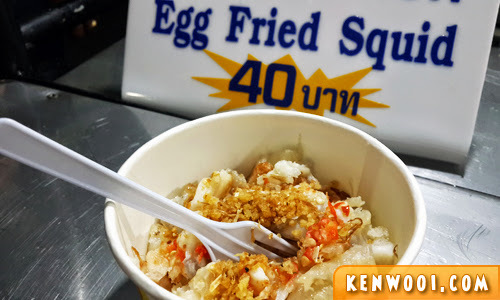 The total “damage” at the Krabi Night Market was ONLY THB230 (RM23.64) – and it was much more fulfilling and affordable than the lunch we had earlier. The verdict: Night market food is cheap, simple, and basically value-for-money. It’s the way to go for budget travelers. 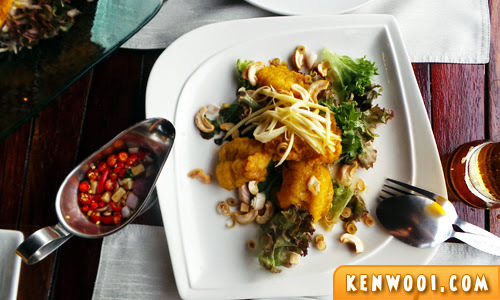 Besides, that we also gave Lae Lay Grill a try at Krabi but it wasn’t a scrumptious experience. The seafood we had were served in small portions and tasted rather average. The verdict: It was a letdown as Lae Lay is known as one of the top restaurants to dine in. On our last day in Krabi, we were searching for a place to have our last lunch before heading to Phuket. 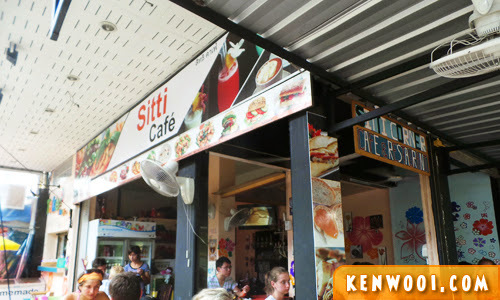 That’s where we spotted Sitti Cafe. 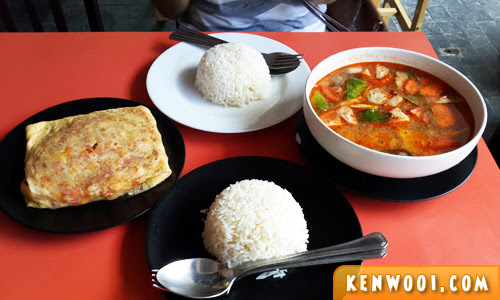 This cafe is probably the only eatery that serves only Thai food – therefore making it more appealing. We ordered the common Pattaya Fried Rice and Tom Yam Kung. The verdict: The food tasted rather average, and the Tom Yam was bland and not spicy. Apparently, you can find better Tom Yam back in Malaysia. 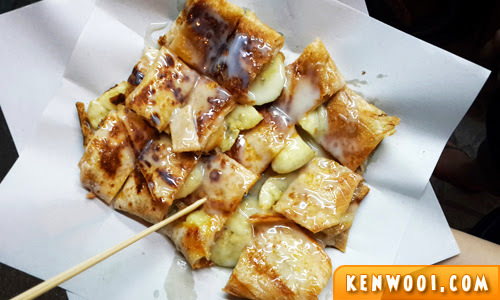 Over in Phuket, we tried some street food as well. 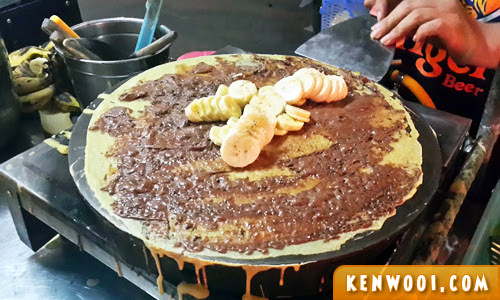 The most recommended street food is the pancake. They can be found at small stalls operating along the streets. At about THB50 (RM5.14), you can pick your choice of filling, such as Nutella, Peanut Butter, and Chocolate. 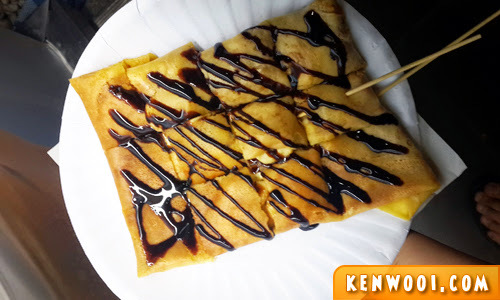 We tried the pancake a few times at different streets. Trust me, it’s a must-eat when you’re at Phuket. This snack is simply delicious! Here’s another version we got nearby Jungceylon Shopping Mall at Patong. This one is not as crispy, but it tastes better than the ones we had previously. Other than street food, we also had various meals throughout the trip. On the day with Hong by Starlight by John Gray’s Sea Canoe, we were served with good lunch and fresh seafood dinner buffet on the ferry. The choices were limited, but both meals were really fulfilling. They served food like seafood, noodles, salad, and fresh fruits. Besides the excursion, our trip’s last dinner at Banzaan Market allowed us to pick our fresh seafood and got them cooked to our desired style. The verdict: It’s definitely the best meal we ever had throughout the trip. What a way to end the trip on a delicious note! Anyway, while some food can be rather pricey, there are always the budget options available – especially at night markets and along the streets. Common Thai food are available at street stalls and they are very reasonable priced, ranging from THB40 (RM4.11) to THB80 (RM8.22). 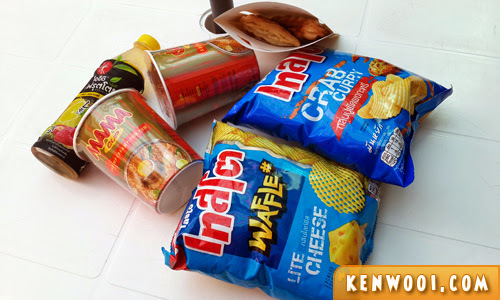 Or… if you prefer something fast, just head to a nearby 7-Eleven or Family Mart. You can get all sorts of snacks and packed food. They are always convenient when we want a quick bite. Overall, I personally think that Phuket and Krabi are not places to have excellent food experience. Food here are just okay, and there’s nothing to boast about. Better in Malaysia? I guess the best ones have left the country to work elsewhere – better prospects, better money, better life. 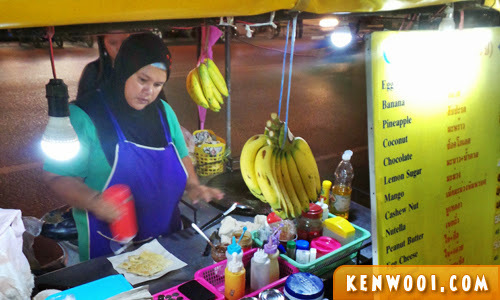 Happens here too – they go to Singapore, KL, Kuching, KK, Miri…anywhere to make a fast buck. There’s one (let’s called it a restaurant cause it’s like the ‘da chao’ of that particular restaurant) restaurant at Subang Jaya which serves Thai food that is in my opinion delicious! It’s not like those fancy fancy Thai restaurant that has food which is quite expensive, rather, it’s cheaper and worthy. You should try it out too!